True love and terminal illness: in the hands of a novice storyteller, these ingredients often translate into sentimental tales of adoration and heartbreak. For comics artist Frederik Peeters, however, they form the basis of a starkly honest diary of self-revelation that transcends both clichés and cultures. 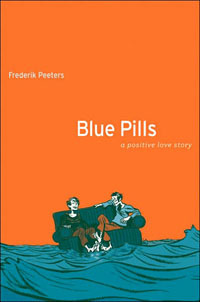 First published in 2001 in Switzerland and winner of the Best Book prize at the 2002 Angoulême International Comics Festival in France, Blue Pills: A Positive Love Story is an autobiographical graphic novel that follows the author’s relationship with his girlfriend Cati. This love story begins like many others. A despondent, cynical young man meets a delightfully optimistic and attractive young woman. After several chance encounters, the two start dating and soon the couple approaches their first night of intimacy. For Frederik and Cati, this moment is where the standard love story ends. One night, alone at Frederik’s place with a bottle of wine placed between them on the table, Cati reveals her invisible secret: she is HIV-positive and so is her four-year-old son. This moment of necessary admission must have signaled the end of many flirtatious relationships for Cati: “Do you want me to go?” she asks Frederik, almost knowingly. Frederick stares back at her, but he might as well be staring into himself. Three silent panels follow. As Frederik continues to stare, words summarizing his most extreme feelings literally emanate from his body: passion, pity, desire, rejection, and sadness. The words flow out from him like smoke from the cigarette, dangling in his mouth. When the anxiety passes, Frederik dives into the fledgling relationship with both caution and curiosity. Peeters’s dialogue is blunt, candid, and believable and, at times, his narrative reflects the poetic rhythm of his story; however, his real strength comes through in the illustrations. As Craig Thompson did in his acclaimed Blankets, Peeters fills the pages with loose, dark splashes of ink brushwork; each stroke feels effortless and casual, like a sketchbook. Still, readers will know that Peeters rendered the stylistically simple illustrations by choice, not by necessity. His method perfectly matches the manner of the story. 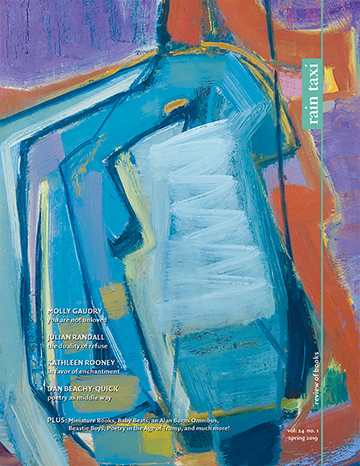 The relaxed style feels personal, honest, straight from the hand of the creator to the page. Although the style is rough and loose, it does not lack detail or emotion. Peeters draws eyes that are both transparent and descriptive and body language that is just as emotionally telling. When Cati and Frederik lie next to each other in bed, the reader feels both their love and lust for one another, but also the restrictive cushion of the disease, which always lies between them. Anjali Singh, a senior editor at Houghton Mifflin, surely recognized the illustrative qualities of Peeters’s work before acquiring and translating the book for the U.S. edition. Like some of her previous overseas comics aquisitions, such as Epileptic and Persepolis, Blue Pills: A Positive Love Story is sure to transcend cultures, intrigue American readers, and receive the same notoriety here as it has abroad. This entry was posted in Uncategorized and tagged spring 2008 on November 27, 2013 by admin.